Tag Archive | "Female Betta (Betta splendens)"
The Female Betta (Betta splendens) like their male counterpart, is undoubtedly one of our most popular freshwater tropical fish species. 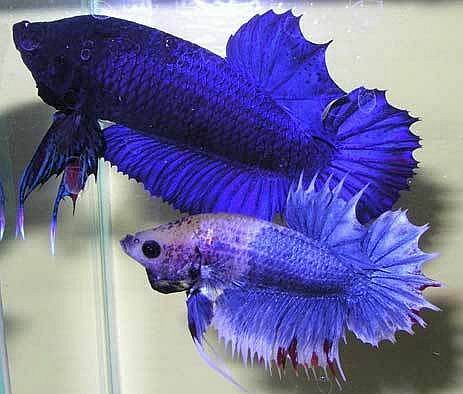 Because Betta splendens are easy to care for, they are a favorite of both beginning and advanced tropical fish keeping enthusiasts. 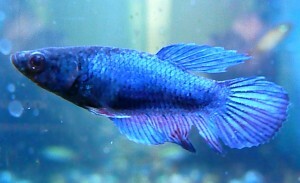 Although Female Bettas are less brightly colored in the various shades and vibrant hues that adorn the males, they resemble the wild Short Fin variety. Like the males, female Bettas are hardy little fish and despite their frail looking delicate beauty can live many years when kept in ideal water conditions. The Betta splendens is often referred to as the “Siamese Fighting Fish” because of the males combative personality towards other males however, the smaller, shorter finned females of the species can usually be housed together with other female Bettas without any serious disputes. Although Bettas are often sold in small bowls or plastic containers, the ideal environment for keeping them healthy is a well filtered aquarium of at least one gallon that holds a steady temperature of between 75° and 86°F. Since they prefer to have a variety of hiding places in their tank, it should be aquascaped with freshwater plants and driftwood , rocks, etc. Female Bettas are easily bred in the home aquarium. Place the male and female together in a small tank until breeding commences. The male “blows” a bubble nest on the surface under a floating leaf or plant. When eggs are laid by the female they are placed inside the bubble nest by the male until they hatch out (usually in 24 hours). The fry should be fed infusoria until they are able to eat powdered flakes or newly hatched brine shrimp. Bettas require a carnivore diet of quality flake food, baby brine shrimp , frozen or freeze dried bloodworms, tubifex or mosquito larvae. Female Bettas are considered ready for sale when they are 1″ or 2″ in length.